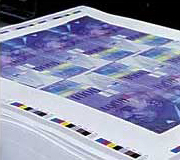 In many printing companies, the digital workflow stops with plate imaging. Preflight, layout, color corrections, proofs, plates and that’s it. The press may have some digital controls, but in most shops, there is still a gap between the prepress workflow and the controls in the pressroom. Unfortunately, this means that the valuable capability to leverage prepress output data in order to preset ink keys on-press remains unused. And because existing proprietary connections often come with high investment costs, there is little incentive to close what might be perceived as just a small gap in the flow of data. That said, many small to mid-sized companies throw away the opportunity to achieve significant savings, better efficiency and greater quality. It was in response to the clear need for a comprehensive and cost-effective solution for ink-presetting and closed-loop that Digital Information developed InkZone. InkZone is independent of all press manufacturers. 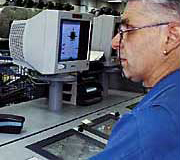 Thanks to dedicated console interfaces, a unique method to make a network connection to most any press console – even on older offset presses – closing the workflow gap is attainable for printing operations of all sizes. Savvy print facilities recognize that InkZone technology breathes new life into old presses. With InkZone, a legacy printing press can function competitively with today’s newest multi-million dollar presses for a fraction of the cost of a new machine – extending the value of an existing press for many years. The InkZone suite consists of components to create CIP data for online ink-presets, closed-loop color control, and the connection of scanning measurement devices allowing for real-time, on-screen visualization of target and actual values. The solution provides networked ink key presetting, so color start-up is accomplished in a fraction of the previous time, bringing a clear increase in productivity. What's more, InkZone generates a database of your settings, allowing corrections and continuous improvement in results over time. This makes InkZone a component that's indispensable on the road to a standardized printing process. Consider the following: As you use InkZone Perfect, it compares the computed preset data with the corrected values during each press run. By reading back the values measured throughout the print run, the calibration curve for a given set of printing conditions can be continuously corrected and will gradually approach an optimum. When it comes to repeat orders, this means a further boost to the speed of set-up sequences, significant savings in paper, and a permanently stable, high-quality printing process. InkZone is based on JDF technology and is fully compliant with global workflows and international standards. The DI-Plot software sends ink coverage values in the form of JDF files to InkZone Perfect for conversion to calibrated machine and print-related values for presetting the ink keys and ductor rollers. The InkZone hardware components send this data via network and in the specific format required by the press console. Closed loop will compliment and carry forward the benefits of digital ink presets throughout the pressrun with the measurement of a colorbar. 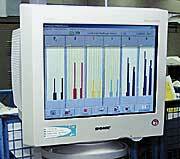 Colorbars can be measured by a variety of scanning instrumentation. InkZone Loop enables users to take advantage of critical closed-loop color control systems to improve the efficiency of ink key and sweep adjustments on nearly all makes and models of press consoles. InkZone Loop enables the automatic measurement and evaluation of colorbars and then direct, digital feedback of the appropriate ink-key adjustments. With InkZone Perfect and InkZone Loop customers enjoy a cost-effective product line that can be retrofitted to older press models or newer presses while using a straightforward, common user interface. The BestMatch feature controls color on press based on LAB/Delta E. Customers can maintain consistent color readings in LAB and not just density, to enable tighter tolerances. The BestMatch feature allows press operators to achieve and maintain the entire sheet within the specified tolerances. With InkZone, the accuracy of the data being sent to the press is consistent and customers can achieve run-to color more quickly than ever before. Additionally, InkZone Report is available for analysis and display of how well current press work matches print industry standards such as ISO and G7.